You get a library of 2000+ proposal templates in this Resources #1 design theme, sample proposals and software for writing any type of proposal in any industry. Get started quick and easy. Order and download for $79. You will find the topics you need to write about: your reader (client, manager, investor, funder), your industry, your project, your products, your services, your financials, and your company or appendix information. Assemble just the topics you need to create your own unique proposal. Output in many formats - Word, PDF, HTML, etc. Your product really helped me overcome writers block!!! It allows me to do my bidding really fast to meet unbelievable deadlines. Thank you and your team." Proposal Pack Wizard guides you with step-by-step numbers and prompts to select your design theme, enter your data, select your chapters, create your documents, and edit them for delivery. Proposal Pack Wizard is a Microsoft Word for Windows Add-in accessed via the Word toolbar. Configurable fast-access lists let you quickly check off the chapters to be assembled into your proposals, contracts and other business documents. The Wizard gives you multiple configurable ways to manage your documents, such as fast-access checklists, presets, searching by name and building your documents from a library of hundreds of example business situations. These Title Page, Recommendations, Cost Summary and Back Pages are just 4 of the 2000+ included pages. You can change the text, colors, fonts, logos and images. By combining different combinations of pages like these from the 2000+ available you can create any type of business document. The rest of the included pages will have this same customizable visual design. The Novice Edition of the Wizard is limited to creating documents up to 10 pages long. The templates are all editable Word format documents you can customize. 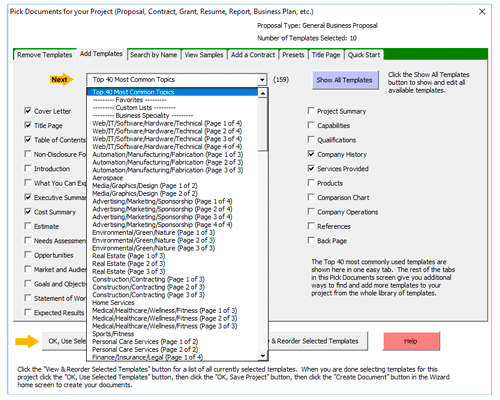 The Proposal Pack Wizard helps automate customizing and assembling documents. Natural resources are your key to the future. Show your clients can deliver the goods with this stock photo design theme. 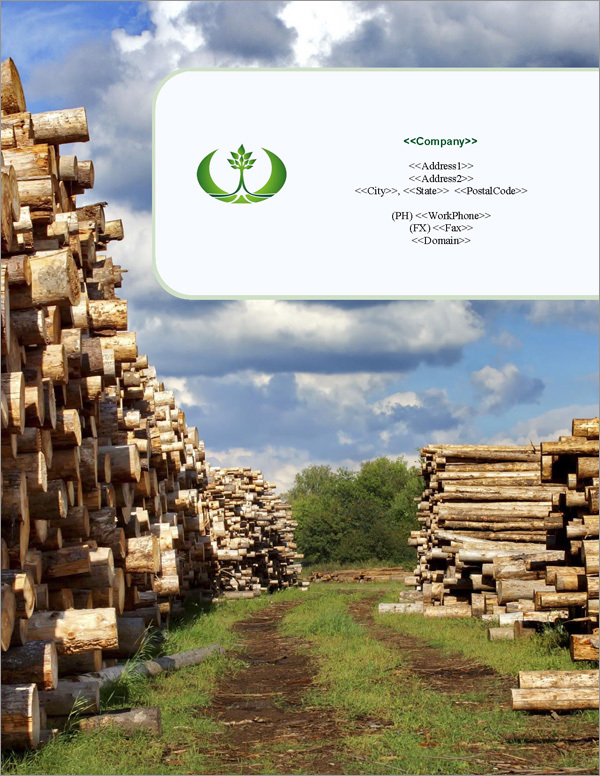 Used by companies and individuals involved in developing natural resources. This Proposal Pack uses the font type "Minion Pro". Q: What is the difference between Proposal Pack Resources #1 and the others? Proposal Pack Resources #1 is a specialty graphic logo design which accents our entire collection of over 2000 business proposal templates. You get a custom design theme consistently integrated through every page of your proposal. We have done most of the work for you already - pre-written proposal letters, contracts and documents complete with graphic designs and title page backgrounds and sample proposals which show you how to create your own. Use the templates as-is, edit the graphics for a custom look and use the optional Proposal Pack Wizard automation software to master your business proposal writing. 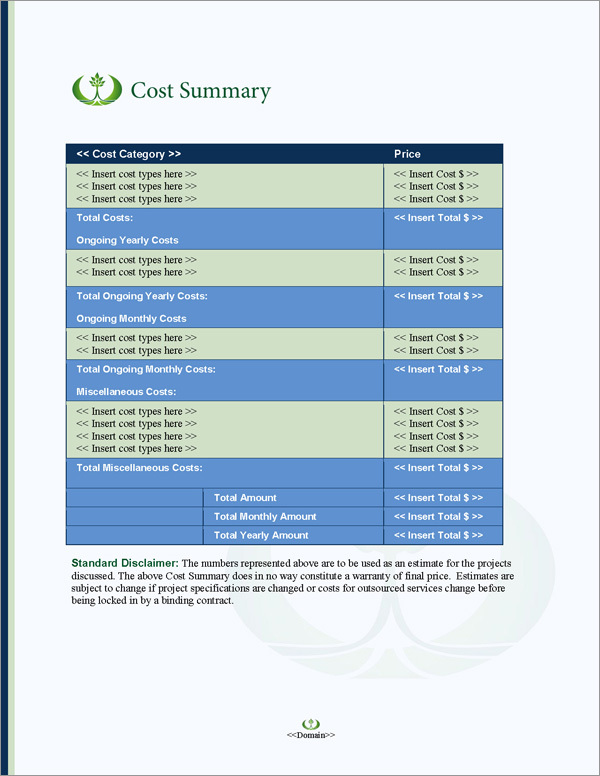 Design elements in the Proposal Pack templates such as colored borders can be easily changed in your word processor. You can change the size, shape and color of the borders, fonts, tables and other elements. Other design elements such as logos, body watermark graphics, custom bullet point graphics and Title Page graphic designs can also be customized. Proposal Packs include the original artwork graphics to make it easier for you to customize our Proposal Pack graphic themes. This type of customizing requires graphic design work using your own graphics editing software. We also provide services to customize Proposal Pack graphic themes. Logos and images included in the Proposal Packs are general purpose and are designed for you to replace with your own logo and images. Stock photography and logos may not be used outside of the Proposal Pack templates for any other purpose. Proposal Packs are downloadable after ordering. Platforms supported include Microsoft Windows, Mac, Linux, Microsoft Word, Microsoft Office, OpenOffice, StarOffice, Word Perfect, Google Docs, iWork, Pages and Appleworks. Proposal Packs are for use with Microsoft Word for Windows or any other word processor than can open Microsoft Word documents. You can output your completed documents in any format your word processor supports. For example, when using Word you can output in Word, PDF, HTML, XML and text formats. When using Pages on the Mac you can output in Word, PDF and Pages format. Also includes many sample proposals, general project and service contracts and non-disclosure forms. Supports creating general business proposals, grant funding proposals, business plan funding proposals, book publishing proposals, letter proposals, government contracts, research proposals, resumes and other complex business documents. The library of included sample proposals covers many different types of proposals in many industries and are included as general guides and help information. Designed for use by any type of business, small and large. Proposal Packs are the framework used to show your prospective clients who you are, what you can do, what you propose to do for them, and most importantly, how they will benefit from the product or service you provide. 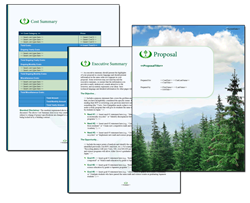 Each Proposal Pack includes over 5300 pages of templates, samples and instructions. 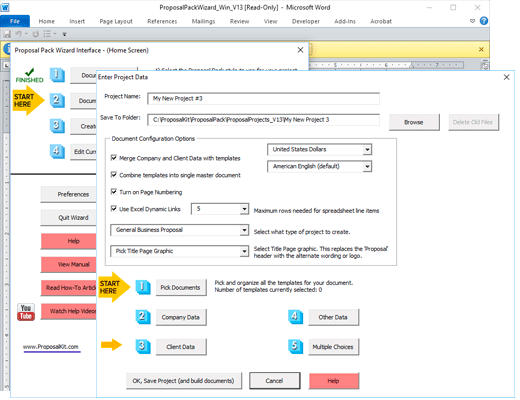 While you can use the Proposal Pack Resources #1 as a stand-alone collection of templates on any operating system or word processor, you get even more power and capabilities when it's combined with the Proposal Pack Wizard Software. The Novice Wizard software requires Word for Windows that can run macros. It does not run natively on Mac. Because the included Novice Wizard is an optional component it is not required to use the templates. Preassembled templates ready to use are included for Mac users and Windows users who do not have Microsoft Word. The entry level Novice Edition of the Wizard software is included with every Proposal Pack. You can add even more capabilities by upgrading to the Expert Edition. Upgrading to the Proposal Kit Professional Bundle is how you upgrade your software to the Expert Edition of the Wizard. The easiest ways to get the discounted Proposal Kit Professional upgrade is to order through the Novice Edition Wizard program and clicking the upgrade link or logging in to the My Orders page of the web site. The Proposal Pack Wizard automates many tasks, such as helping you select templates for your specific business situation, merging contact information, preparing your cover letters, contracts, table of contents and much more. If you need even higher end features such as sophisticated database-driven quote and price calculations there are third-party add-on options for those capabilities. Proposal Packs are designed for use by any business. 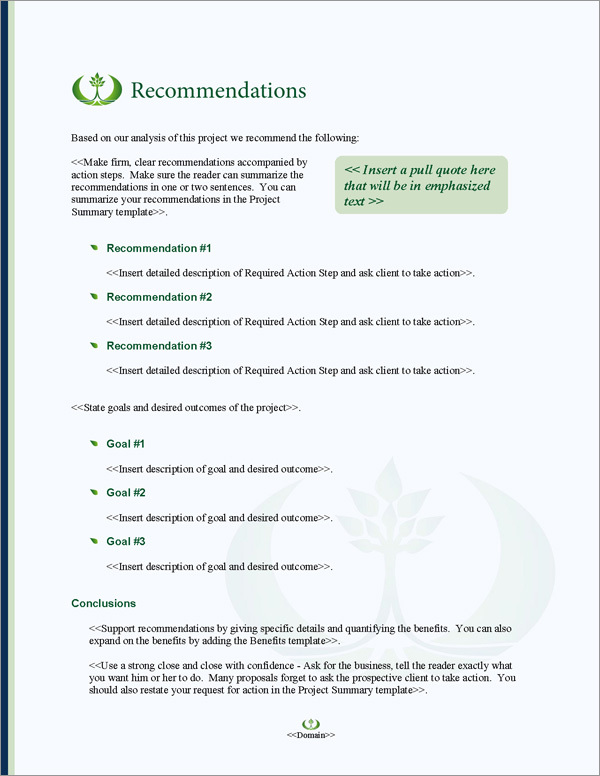 The Proposal Packs are collections of proposal documents designed using industry standard guidelines. Our documents are pre-designed, complete with graphics, and are mail merge-enabled to automate fill-in of common fields (personal information, names and addresses). We have already done the time consuming layout, design and graphics for you. Just fill in the blanks and easily create anything from a three-page small business proposal to an enterprise-class proposal hundreds of pages long. 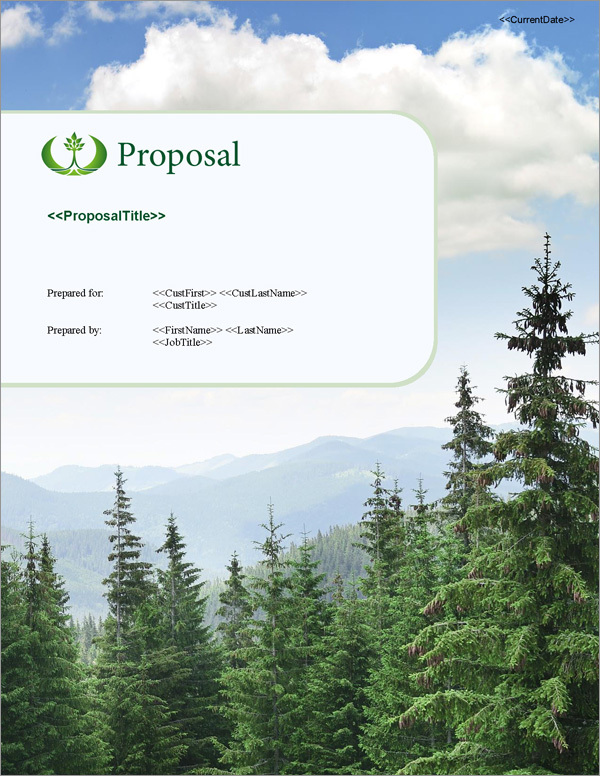 The templates in "Proposal Pack Resources #1" have a distinct visual style integrated into them. *** The free Proposal Pack offer with Proposal Kit Professional Bundle only applies to your first Proposal Pack. All others after the first are discounted 70% off. You only get one free Proposal Pack design. your packs today and finished a business proposal in one day that would otherwise have taken me a week to do and the result was far more professional looking..."
summarize in the best of fashion all the finest practices for businesses in their dealings with customers, mostly because they remain focused on the client's solution, giving back to the customer the control over his project."